Even though we are still considered to be in a long-term drought, 2012 has begun on a wet note. January and February have brought a good measure of moisture to dry, dry Southeast Texas and to my garden, and, to a lesser degree, to other parts of the parched state. It has been a blessed relief to thirsty plants and to the depleted aquifers and reservoirs. The meteorologists tell us that we are still under the influence of La Nina which generally brings dry weather and probably does not bode well for our long-term prospects. All the more reason to get those rain barrels and other water collectors in place while the rain is still falling so that we will have water for our plants - water that we don't have to pay for - when the going gets drier. There is a possibility of rain in the forecast for this week. Already the soil in my garden is beginning to dry out from our last downpour, so another infusion of moisture would be most welcome. Moreover, I am intending to plant some vegetables this week, including putting into the ground the tomato and eggplant plants that I started from seed in January and rain would be very helpful for them. I feel silly about even considering putting these plants out so early, but I really doubt that we are going to have any more freezing weather, and, if we do, I have plenty of freeze blankets so I can just wrap them up. And I have learned to my sorrow in the last two years just how important it is to get those tomato plants going as soon as possible. Once the temperatures get to be consistently above 90 degrees, the plants begin to shut down production, and 90 degree weather seems to come earlier and earlier every year. My tomato crops in 2010 and 2011 were a bust, but I have high hopes for these plants. Shumard red oak tree awakening in the garden this week. This week in the garden has been a very productive one. Lots of weeding, lots of dividing and replanting perennials, lots of pruning (including the last of the rose pruning), and the vegetable plants that I started in my garage under the grow lights are just about ready to go into the garden. I just need to harden them off a bit before I send them out into the world on their own. In addition to all that, I've added a few new purchases to the garden this week. First of all, I like my 'Graham Thomas' rose so much that I decided to order some more David Austin roses. I received the three plants I had ordered this week and got them planted. I got 'Darcey Bussell,' a crimson red rose; 'Lichfield Angel,' creamy apricot to white; and 'Lady of Shalott,' a salmon pink/golden yellow bicolor. I will also be getting 'Molineux,' a yellow rose, which will be delivered a little later. If I enjoy these roses as much as I have 'Graham,' I will be one happy gardener. Today, my daughter and I went over to Arbor Gate to look at their fruit trees and I came home with a 'Red Baron' peach to plant in the spot where my old apple tree used to be. I saw at least three other fruit trees that I would really like to have, but first I have to figure out if I actually have room for them. Of course, the big event in my garden this week really had nothing to do with plants. It was the ending of the four-day weekend Great Backyard Bird Count. Even though the weather was not very pleasant for much of the weekend, I did manage to count 32 species of birds in my yard. I missed perhaps another ten or so. I think my favorites were the Cedar Waxwings that showed up en masse this week. If our good weather continues to hold out - preferably without the gale-force winds we had today! - I hope to actually get some spring vegetables planted next week, and I hope to see some more of the potatoes that I planted a couple of weeks back beginning to come up. So far only one has showed itself above-ground. And maybe I will go back to Arbor Gate for some more of those fruit trees. Not all the flying visitors to my garden this week were feathered. On Wednesday, this pretty Red Admiral butterfly showed up and spent time sunning himself on one of the old grape vines. The rain this week has carpeted my backyard in bright yellow Carolina jessamine blossoms. Even the birdbath is decorated with the blossoms. Elsewhere in the garden, the banana tree that never died back all the way to the ground this winter is beginning to sprout new leaves. And the fig trees, too, are showing new leaf buds. Yes, spring is almost here. Can it really be mid-February already? Where did January go? Winter here in Southeast Texas, zone 9a since the new USDA hardiness zones map was published, continues to be a relatively mild affair. and now spring is in the air. The birds are already in their courtship phase. The males are trying to entice the females with their spring songs. Even the male green anole lizards were out in the sun today displaying their colorful throat pouches. This one had picked a spot on my vegetable garden fence to strut his stuff. A few daffodils have shown their pretty faces in my front yard garden. Truthfully, though, I never get very good results with bulbs, even Southern garden-acclimated ones like this one. I do have a little better luck with the leucojum. I'm glad because I love these delicate little blossoms. The trailing purple lantana has been in full bloom since the autumn and continues to attract my winter butterflies. The Carolina jessamine is at its height of bloom on this Bloom Day. That's a good thing because the butterflies really love it. A pair of beautiful Pipe-vine Swallowtail butterflies were sharing these blooms today. In the vegetable garden, the arugula has bolted and started blooming. The bees swarm all over the blooms, but they'll have to find other flowers to sip because the arugula is being pulled out this week to make way for the spring garden. Purple oxalis thrives in the relatively cool temperatures of winter. It poops out when things start to heat up. I love antique roses in general. They are mostly the only kinds of roses I grow in my garden, except for some Knockouts. One of my favorites is 'Old Blush.' It is full of blooms now and has been in bloom since mid-January. It will continue to have flushes of bloom sporadically throughout the year. It is never completely out of bloom for very long. The loropetalum adds its colorful fringy blossoms to the garden scene in February. February is also the time that the blueberry shrubs start to send out their dainty little blossoms. Several of the roses, like this 'Ducher' are almost ready to bloom. On the other hand, the Turk's cap has been in bloom since last summer and hasn't missed a beat in blooming all winter. By the time Bloom Day rolls around in March, spring will be well under way here, even if it hasn't officially arrived, and my garden should be a much more colorful place. In the meantime, for more color, don't forget to visit our hostess Carol at May Dreams Gardens and check out the list of all the gardens participating this month. Thank you for visiting my garden today. P.S. This upcoming four day weekend, February 17 through February 20, is the time for the Great Backyard Bird Count. All across North America and in the state of Hawaii gardeners and birders and people who just like birds will be counting the birds that they see and reporting them on the GBBC website. I hope you will join me in participating in the event. It's fun, it's free, and it's easy. Just go to the website and get your instructions, register your site and get ready to count. Happy GBBC/Presidents Day weekend! One of the birds I'll surely be counting this weekend is the beautiful Pine Warbler, a frequent visitor to my feeders. Well, we have to have SOMETHING to complain about! Another rainy day and more on the way this week, I understand. So, is the drought over yet? I've gotten about half an inch of rain out of this particular weather system so far. The soil in my garden has been well-saturated for days now. Sweetly fragrant Carolina jessamine is at its peak of bloom in the garden this week. Here we are at the tenth day of February, not even halfway through the month, and already this month we have received more than twice as much rain as we did in the whole month of February last year. So far this month my backyard rain gauge has measured 2.24 inches. Last year for the entire month we had .67 of an inch. What a difference a year makes! Thanks to all that rain and to the mild temperatures we have had, everything looks lush and green, especially the weeds. It is quite unlike the gray and brown landscape that we normally see in early February. The rain has left the ground completely saturated and not conducive to many of my normal gardening tasks, but at least I was able to continue with my pruning. I got most of the rest of the roses pruned this week, including the 'Radazz' Knockouts which grow along my neighbor's fence that extends along part of my front yard. Those shrub roses had grown rampantly last year when they got only minimal pruning. Knockouts don't really have to be pruned except for shaping, but these were out of control and needed to be reined in a bit. It was difficult to cut them back though because they were full of fat buds that were just about ready to burst into bloom. Nevertheless, I steeled myself and made my cuts. I expect it will benefit the plants in the long term. I still have a few more roses and a few more shrubs to prune and shape. My Felcos are my most useful garden tool these days. By the end of next week, I hope to have this particular task completed. As I was walking around the garden today, I noticed this sweet little dianthus in bloom. It had been beaten up by the rain but still offered a splash of fuchsia amid the green. Elsewhere, 'Old Blush' has been in bloom since mid-January. Very little daunts this old rose. I am sorely tempted to start planting some of my spring veggies in the garden, but I keep reminding myself that there are five more weeks of winter left and we may still have some freezing temperatures. I'm not sure how much longer I'm going to be able to hold myself in check. I am longing to get those vegetables growing! My little kumquat tree that I purchased and planted last spring has been producing a steady supply of these wonderful fruits since last summer. Only one year ago I had never tasted a kumquat. Then, in the spring, I was looking for some citrus trees to add to my yard. I wanted a lime, but the nursery was sold out. Then I saw the little kumquat tree. It looked healthy and perky and I thought it might be interesting to grow something with which I was totally unfamiliar. So I took the tree home with me and planted it in a big pot. A few months later, it started producing these little fruits that look like miniature oranges. A few weeks after that, as the first fruits turned a shiny yellow-orange, I plucked one from the tree and popped it into my mouth. Wow! I will not be without a kumquat tree in my garden again. Many, probably most, botanists do classify the kumquat as a citrus although others put it in its own genus, Fortunella. The plant does look like a citrus and the fruit has a somewhat citrusy taste. It combines sweet and sour. The edible rind is mildly sweet and contrasts nicely with the flesh of the fruit which can be tart and sour. It's a nice taste sensation. The fruits have tiny seeds which can be removed if the fruit is sliced, but I usually just eat them whole, seeds and all, or sometimes, if the seeds seem especially big, I'll spit them out. Kumquats can be kept at room temperature after picking for a few days, or you can place them in an airtight container in the refrigerator for up to two weeks. You can also leave them on the tree for a good long time and just pick them when you need them, which is essentially what I do. These little fruits are said to make wonderful marmalades and jams. Although I haven't actually tried it yet, I can certainly imagine that that would be true. They are also used in chutneys and relishes and as a complement to savory dishes, as well as in salads. Here's a recipe for chutney which sound delicious to me and which I hope to make soon. In a dry skillet over medium heat, toast mustard seeds and aniseed. Gently shake the pan in a back-and-forth motion until seeds are aromatic and lightly toasted, about 1 to 2 minutes. Transfer to a heavy, small saucepan with remaining ingredients. Bring to a boil, stirring often. Reduce heat to medium-low and simmer until the chutney thickens and the kumquats become translucent, about 10 to 15 minutes. Transfer chutney to a bowl and let cool before serving. Chutney can be stored in an air-tight container in the refrigerator for up to two weeks. Bring to room temperature or reheat on the stovetop before serving. The kumquat really is an amazing fruit; moreover, it is not at all difficult to grow in our area, zone 8b to 9a. Why don't you consider adding one of these small trees to your garden? Not this month's full moon, this is actually last year's Harvest Moon, but I'm betting that tonight's moon will look much like this! Tonight we welcome this month's full moon. According to the nomenclature of the Native Americans, this full moon will be the Snow Moon. It was so called because this is the time of year when the heaviest snows of the year often fall in the northern hemisphere. No snow for us though. Not this year. It's been a strangely mild winter so far and there doesn't appear to be any really cold or wintry type weather in the offing. Instead, we have relatively warm days and somewhat cool nights. It's quite a contrast to our winters of the last couple of years. It may be as a result of the mild winter that there have been so many reports of overwintering hummingbirds in our area. For several years now, there have been sporadic reports of Rufous Hummingbirds that spent the winter here. These hummers are built to take somewhat colder temperatures than some of the more tropical varieties, but this winter there have been reports of Ruby-throated, Allen's, and even a tiny Calliope that have chosen to spend this season in Southeast Texas. For the first time (at least to my knowledge), my own garden has been host to hummingbirds in winter! I've had at least two Rufous Hummingbirds in the yard. Here, one of the birds sits on a budding fruit tree limb. Once I realized I had a hummingbird in residence, I filled one of my feeders and hung it outside. It didn't take her long to find it. 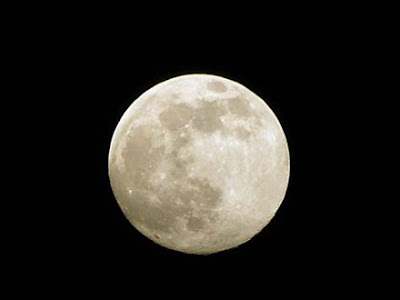 So, all in all, it's a very unusual winter that the Snow Moon will be shining down on tonight. The ground is saturated from recent rains, everything in the yard has "greened up" already, and there are hummingbirds here. An unusual winter but definitely a relief from our recent past. 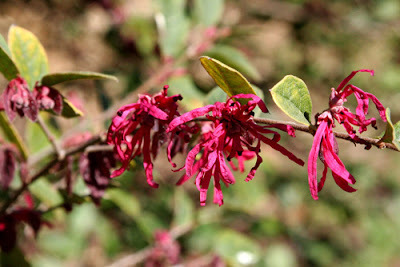 The loropetalum has been covered in these fringy blossoms this week. This week in the garden has been a wet one. We've had intermittent rain all week and I treasure every drop. There is a down side, however. The wetness has meant it has been hard to get much done in the garden and, frankly, there is a lot that needs doing. Right now the weeds are getting WAY ahead of me. If the rain clears out this weekend, I'll have my hands full trying to catch up. Also, I still have a few more perennials that need to be moved, including some crinums that have become much too crowded. And I still have more pruning to do. I did manage to do some pruning in between showers. I cut back the flame acanthus which had grown rampantly all last summer. I usually trim it back some in summer but I was reluctant to touch it last year; consequently, the hedge along the veggie garden had grown almost as high as my head. I also got the hamelias cut back. In most winters, these shrubs die all the way back to the ground, but this winter they all had some stems that were still alive and leafy. There are still a few more roses and other shrubs to prune and I need to make my way to the fruit tree sales to pick up a couple of things. Things are progressing in the garden, with or without my presence, and whether in the direction I would choose or not. Maybe next week will be a better one for gardening and I can begin to get a handle on things. 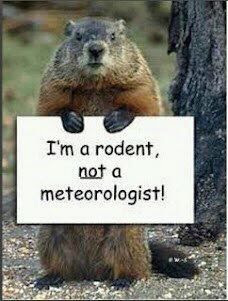 Well, Punxsutawney Phil has spoken and it seems we will have six more weeks of winter. The sleepy rodent was pulled out of his burrow by his official keepers today, saw his shadow and went right back inside. According to his interpreters, that means six more weeks of winter. Of course, the dirty little secret is that no matter what Phil says, we will have six more weeks of official winter until Earth makes enough of a circuit of the sun to bring it to its vernal equinox on March 20, just over six weeks from now. But that's only the official date for spring. In my yard, virtual spring has already sprung and my personal groundhog did not see his shadow today because of heavy cloud cover and intermittent rain. In fact, nobody saw his shadow in my yard today. Maybe next year we should let ol' Phil sleep in!